DMi D&M Europe has announced the launch of Escient Zone, its exclusive powerful, cost competitive, integrated CI home control system. The launch of Escient Zone this month is accompanied by an extensive programme of product support and training for DMi appointed installers. The introduction of Escient Zone is a further milestone in the development of a fully end-to-end, home entertainment and control solution from D&M’s dedicated CI division. Zone complements the latest Ethernet and WIFI network enabled AV source and control components from D&M’s Denon, Marantz and Escient brands. Its introduction enables DMi appointed CI professionals to offer in-home automation systems, seamlessly incorporating market leading components from these premium brands. Zone is positioned to provide fully featured, high performance home automation and control, at a lower price point than current market leading systems; enabling CI dealers and custom installers to extend their target market for integrated home automation. Likewise, it enables a greater number of dealers to gain full access to a single integrated home control system as an alternative to configuring components from disparate manufacturers; providing an easy to install and operate solution with a guaranteed performance capability. DMi is bringing Escient Zone to market with a full programme of support and training for installers in all of the European territories where it is the exclusive D&M CI distributor. Product training will be given in line with the approved levels of certification being introduced, and information about training and certification is being provided via local DMi sales representatives from the particular D&M subsidiary companies. 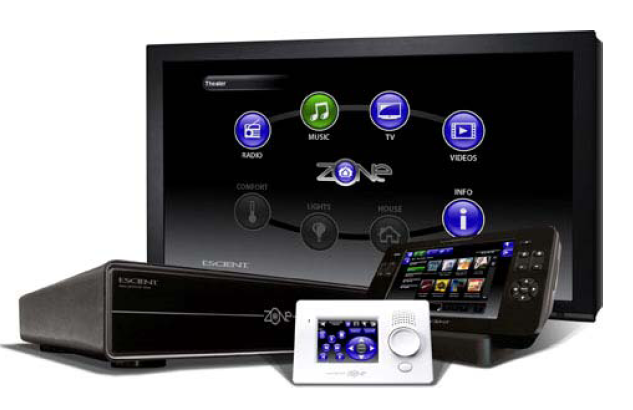 With Zone, DMi will enable many dealers to enter the home automation market for the first time. Training and support will assist them in the transition to full CI system integrators. At the same time, a dedicated website – www.escienteurope.com – has gone live, providing full product and system information. Escient Zone is a single integrated home automation and control system, for control of AV equipment, lighting, HVAC and security systems. providing media management and efficient programming, with auto generated TV screen and touch panel user interfaces, in an affordable, easy to use and install system. Being a 2-way control system, Zone can control ‘external’ devices and systems and receive status feedback from these, including, for example, lighting systems, Denon and Marantz AV receivers, and other RS232 and IP controllable systems and devices. Primary system components include a choice of main system controllers, offering infra red, and serial control, relay output and contact input with power / status sensing, and a full complement of analogue and digital connectivity; including USB, Ethernet and in-built ZigBee server. The flagship MC600 controller further provides media management, with a 160Gb internal HD and extensive streaming capabilities. Remote controllers include in-wall, wired and wireless touch screen and keypad options. AV distribution components include matrix switching multichannel amplifiers, audio matrix switchers and wireless network amplifiers, and video matrix switchers. Lighting control is provided via wireless switches, dimmers and in-line dimmers, and climate control by a wireless thermostat. DMi Brand Director, Bert Kiggen, commented: “With Escient Zone we are introducing a control system that provides a high performance, cost effective means for CI professionals to offer full home automation and networked AV employing the latest ground breaking components from our Denon, Escient and Marantz product ranges; themselves recognised as offering the best quality and performance features available in the market. DMi D&M Installation, a division of D&M Europe, is dedicated to providing a comprehensive range of integrated custom installation solutions from a portfolio of dedicated products from D&M's Denon, Marantz, Escient, Boston Acoustic and Snell Acoustics brands, and other product lines for which it is the exclusive European distributor. DMi is similarly dedicated to providing its appointed custom installers with exemplary support and after sales services.